Amanda Donnelly, DVM, MBA, fell in love with veterinary medicine when she was a 9-year-old girl pitching in at her father’s small animal hospital. Mary Beth Leininger, DVM, a lifetime animal geek, caught the veterinary bug even earlier in elementary school. Ernie Ward, DVM, saw his future when he was “knee-high to a grasshopper,” he quipped. Drs. Donnelly, Leininger and Ward made good on their goal of becoming a veterinarian and have succeeded professionally in many other ways. The three of them are giving back to their cherished profession by serving on the Today’s Veterinary Business editorial advisory board. They join three other veterinarians, a veterinarian/lawyer, a second lawyer, a certified public accountant and a person with 22 years of digital marketing experience who will help Today’s Veterinary Business become the magazine world’s leading source of practice management, business and personal wellness education for veterinary professionals. 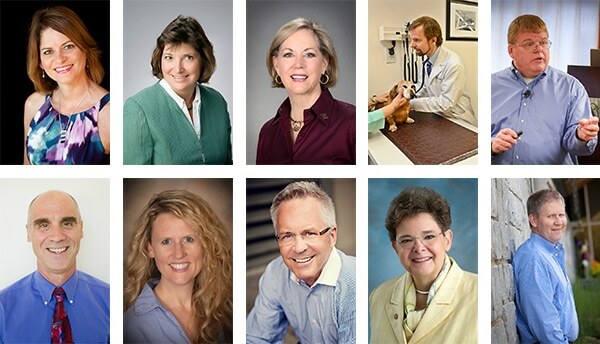 All 10 board members agree that improved business acumen is crucial if the magazine’s core audience — veterinarians, practice owners and practice managers — is to thrive professionally and financially. “The veterinary profession is at a crossroads,” said board member Jeff Thoren, DVM, PCC, BCC, who co-authors the Go With the Flow personal wellness column. “Faced with a variety of stresses including rapid technological change, ongoing economic challenges, and increasing levels of personal debt and professional burnout, it’s clear that we need to consider new ways to preserve the health of our practices and the people who work in them. The advisers come from practice, business and academia. They range from Eleanor M. Green, DVM, DACVIM, DABVP, the Carl B. King dean at the Texas A&M University College of Veterinary Medicine and Biomedical Sciences, to industry veteran and current practice owner Zack Mills, DVM. Dr. Mills went from buying a practice in 1985 — a year after earning his DVM at the University of Georgia — to taking jobs with Merial Ltd. and Hill’s Pet Nutrition to returning to practice in 2012, when he opened Tiger Tails Animal Hospital in Duluth, Georgia. He believes that privately owned hospitals like his will remain in the majority for a long time. Six board members spend their work hours as professional advisers. Drs. Donnelly, Ward and Thoren own consulting firms, as do H.R. Huddle columnist Charlotte Lacroix, DVM, JD; Politics & Policy columnist Mark Cushing, JD; and Fritz Wood, CPA, CFP. Wood, who also is closely associated with a financial planning firm, said financial security isn’t an impossible goal for veterinary professionals. “It is rewarding to see light bulbs go off in people’s heads as they finally get how marketing can send tails through the door of the hospital,” she said. Dr. Leininger spent three decades as a Michigan practice owner, served as president of the American Veterinary Medical Association and this year retired from an executive role at The Hartville Pet Insurance Group. Networking and savviness can help veterinarians succeed, she said. A run-in with a patient convinced Dr. Mary Beth Leininger that avian medicine wasn’t for her. “My first injury was from a duck that beaked my nose bloody and broke my glasses when I was examining a wound he received from the neighbor’s dog,” she recalled. Fritz Wood’s sister financial planning firm, Triune Financial Partners, manages more than $500 million in assets, including more than 70 401(k) plans. Kelly Baltzell isn’t a veterinarian, but she knows a fair amount about invertebrate animals. “I have had the same worm farm colony for the last 10 years,” she said. Eleanor Green owned a Mississippi veterinary hospital before she moved into academia at Mississippi State University and Texas A&M University. As a New Jersey 10-year-old, Dr. Charlotte Lacroix saw a goat advertised for sale in New York. Her parents said, “If you can figure out how to get it, you can have it.” She found a way to pay for the goat and transport it home. Amanda Donnelly loves football. She roots for the University of Missouri, the Kansas City Chiefs and the New England Patriots.